We’ve been enjoying some of Cute W’s birthday gifts, a pasta roller attachment for our KitchenAid and a ravioli mold. Cute W is a sucker for kitchen gadgets, and the rest of the family gets to enjoy the spoils of his labors whenever he gets something new. In retrospect, I sort of can’t believe that it’s taken us so long to acquire a pasta maker, because homemade ravioli is a big tradition in his family. 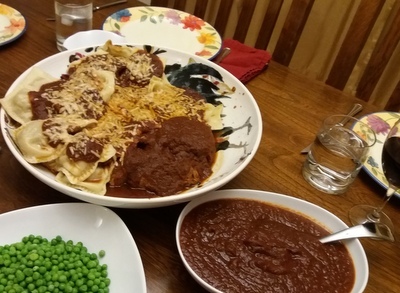 Sure enough, his first effort was the traditional family recipe, meat ravioli with roast and cabbage inside and more roast plus sausage next to the raviolis, all topped with homemade tomato sauce and a bunch of Asiago cheese, plus plenty of extra sauce and the obligatory peas on the side. He did an excellent job. We are looking forward to a cheese ravioli effort. Meanwhile, Cute W realized that the same press and ravioli maker would be great for making Asian dumplings, too, and everyone was super-psyched to help him test out that experiment. Look how good these look! 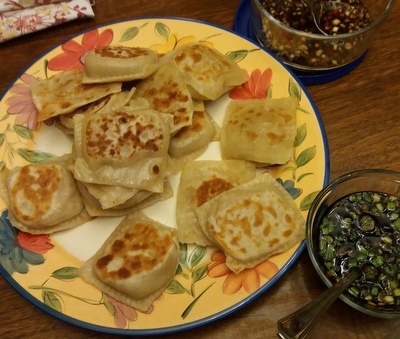 He made special potsticker dough and stuffed some with pork and some with edamame. The pork ones were pretty much restaurant quality. The edamame (cobbled together from this and this) could use a little tinkering–we are thinking about throwing in some cabbage and/or mushrooms for those. But all in all, these were some excellent meals. Go, Cute W!